For some people, retirement means kicking back. For Officer Terry Simon, retirement just meant moving on to help Metro riders in another capacity. Terry Simon was as a Metro Bus operator for 24 years, mainly working Line 111. After retirement, Terry decided she wasn’t ready to leave Metro just yet and became a Rail Safety Ambassador to help educate communities about rail safety. But eventually even that wasn’t enough, and Terry took the next step and became a Metro Transit Security Officer. Terry graduated earlier this month along with 14 other new officers whose knowledge, physical strength and mastery of skills led to their successful completion of the police academy’s high standard of performance, commitment and hard work. 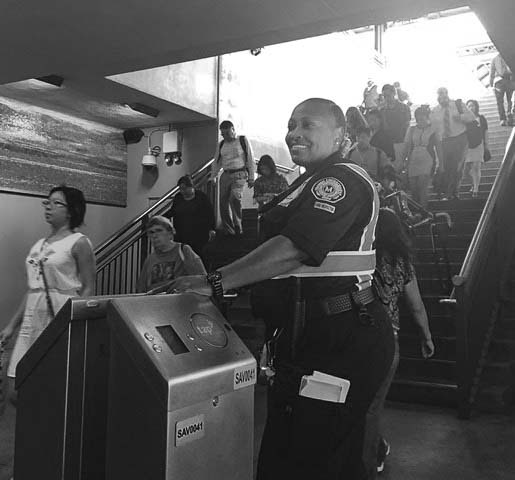 As a Metro TSO, Officer Simon’s duties will include patrolling and guarding Metro property; monitoring security and situational awareness cameras and alarm systems for behavioral threats, and; performing fare inspections. After all these years, Officer Simon is still finding a way to provide excellence in service and support to our customers, and we’re very proud to have her as a member of the Metro family. If you see her while she’s on-duty, give her a wave!